Former China Taoist Association Chairman Min Zhiting discusses the Chinese Taoist population, how Taoists are helping improve literacy, Tao gods, and becoming a monk. 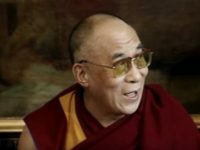 This interview was conducted by Taoist Restoration Society in 1999 and appeared on Kenyon College. It’s presented as part of our #InTheirOwnWords series. 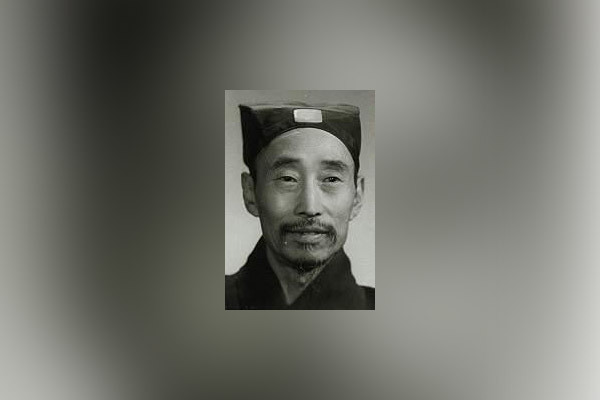 Min Zhiting took over the China Taoist Association in 1997 upon the death of former Director Fu Yuantian. A native of Henan, the 76-year-old has spent most of his life in Shaanxi province on Huashan. TRS talked with Mr. Min earlier this year in White Cloud Temple (Baiyunguan), where the China Taoist Association is headquartered. Min Zhiting took over the China Taoist Association in 1997 upon the death of former Director Fu Yuantian. A native of Henan, the 76-year-old has spent most of his life in Shaanxi province on Huashan. TRS talked with Mr. Min in White Cloud Temple (Baiyunguan), where the China Taoist Association is headquartered. TRS: Tell us about the number of Taoist adepts and Taoist believers in China. “In the Spring Festival there are tens of thousands of people come here to pray.”Min: Those who live in the temples, like me, are not very many. We total around 15,000. Those who don’t live in the temples are quite a lot. As you know, Taoism has two branches: One is the Quanzhen branch, the other is Zhengyi branch. Taoists of the Zhengyi Branch who live among ordinary people amount to 40,000 to 50,000. We also have many believers. For example around our White Cloud Temple every first day and the fifteenth day of each lunar month many people come here to burn incense and pray. In the Spring Festival there are tens of thousands of people come here to pray. People who have Taoist beliefs in China number over 100 million. TRS: Among those 15,000 you mentioned, are they all from Quanzhen Branch? Min: Yes, although there are few Zhengyi Taoists. TRS: Do the majority of Zhengyi Taoists live at home? Min: Yes, they go to temples when there are religious activities. In Shanghai, Suzhou, Maoshan, such is the case. When there is a temple gathering, they go back to temples. Taoists who live in temples are a minority. TRS: Among those 15,000 Taoists how many are from the Zhengyi branch? Min: Less than 1,000 live in temples. TRS: How many temples are in China? Min: The open temples with government’s approval as national key temples are not many. They total 21 and belong to a catalogue approved by the State Council. Including temples with approval from Provincial, Regional and County governments, the total is over 1,700. TRS: How about closed temples? Min: There are some activity spots, we have no statistics of them, yet there are many. For example, in just Zhejiang province, we have 400 to 500 activity spots. Even in one district of Fuzhou, Fujian province, we have more than 70 activity spots, yet these are not open temples, just activity spots. TRS: People go just for festivals? Min: Yes, they go in the festivals, burn incense, and pray for happiness. TRS: We’ve noticed a small closed temple in Beijing’s Financial Street. Min: There is a Luzu (Lu Dong Bin) temple. We have a Taoist there, however it is not officially open. It has not been approved by Beijing Municipal government. It is just an activity spot. TRS: Will the temple in Financial Street be reopened? Min: Yes, the government has listed it for the protection. TRS: Tell us about the Dongyue (East Peak) Temple in Beijing. It used to be one of the largest in Taoism. Now it’s a museum. Min: Yes, it hasn’t been put to religious use. Historically Dongyue belonged to our Tianshi Branch, that is Zhengyi Branch. TRS: According to newspapers the biggest challenge of Taoism is to improve literacy of Taoists. What percentage of Taoists are graduates of high school, according to your knowledge? Min: In China we don’t have such statistics. Among those 15,000 to 16,000 Taoists, how many Taoists are high school graduates, we are not clear. Nor with our 197 delegates. Our leaders, including chairman, vice chairmen, general secretary, are all high school graduates, some of them are even college graduates. The literacy level of old Taoists is low. Those of 60 or 70 year-old Taoists, because whey they were young they didn’t go to primary school, they went to private school instead. Young Taoists are generally graduates of middle school or above. For enrollment in our Taoism College (Daojiao Xueyuan, located in White Cloud Temple) and our cadre training course, the minimum education level is middle school. Among this term of our Taoism College students 70% to 80% are high school graduates. TRS: How can Taoists’ literacy level be improved? Min: We improve it from many channels. Above all, through our China Taoist Association we improve their level, not only improve their literacy level, but also expand their Taoism knowledge and political knowledge, social knowledge. In our Taoism College courses about religion account for 70%, while cultural courses make up 30%. TRS: How many students there each year? Min: Each class has 50 students, all from local temples. They need to be Taoists for at least one year, and recommended by their temples, then their name is sent to the local administration of religious affairs for approval. They must be reliable politically, have no question on their lifestyle, live a decent lives. Then after they passed an examination, they can come here to study. TRS: Do you have such courses in local temples? Min: In local temples they have training courses. Besides in Qingchengshan (located outside of Chengdu in Sichuan province), Shanghai also has a Taoist college. All others are training courses. Training courses could be as long as one year, or as short as two or three months. TRS: Is Shanghai a Quanzhen branch, too? Min: They are Zhengyi Taoist. TRS: How about Chenghuang Temple (a recently opened temple in Shanghai)? Min: Chenghuang Temple has been returned to them, it’s not a place for college, just a location for religious activities. “People who have made contributions to our people and country won’t be forgotten by their descendants. “Min: Chenghuang Temple was returned in 1997. Now just the temple and the palace are under religious administration. (Note: The rest of the buildings are stores.) Originally the area around Chenghuang Temple had no business activities. At the end of 1920’s and early 1930’s, after over 10 years of the Republic, the area around Chenghuang Temple became a business area. A long time ago the area near Chenghuang Temple, including Jiuqiu Bridge, bookstores and businesses all belonged to the temple. TRS: In Beijing’s White Cloud Temple, how many people come ordinarily? Min: Not many people on ordinary days. On weekends there are more people, on weekdays one or two hundred people. TRS: Besides the Spring Festival what are the important festivals? Min: Important festivals include Lamp festival, the first day and 15th day each month, the Sanyuan Festivals, July 15, October 15, Dongzhi, Xiazhi, Jiuhua Hui, etc. People crowd in during these festivals. During the Zhongyuan Festival, more than 100,000 people come. TRS: What is the major god here at White Cloud Temple? Is it Qiuzu (Qiu Changcheng, one of the founders of the Quanzhen sect)? Min: Yes, the major god here is Qiuzu. He was the disciple of Wang Chongyang, the Quanzhen Monk at the end of Jin Dynasty and in the early Yuan Dynasty. His achievement was persuading Genghis Khan to stop slaughtering people. He persuaded Genghis Khan to respect the heaven, and love people. TRS: In a small village south of Xi’an is Chongyang Palace. Min: Chongyang Palace is in Huxian county of Shaan’xi, which is where Wang Chongyang cultivated himself. After he acquired doctrines there, he went to Shandong to spread them, and there he taught seven disciples. When Wang Chongyang reached Kaifeng, Henan province, he ascended to heaven. After he died his four disciples, including Qiu Changchun, Tan Changzhen, and Liu Changsheng carried his body to the place where he cultivated himself, and buried him there. Therefore, Huxian is the place not only where Wang Chongyang cultivated himself, but also where he was buried. TRS: Tell us about the latest version of the Taoist Canon that you’re editing. Min: The current Taoist Canon is from the Ming Dynasty, either the Wanli Xizang or Zhengtong Daozang. Wanli Xizang and Zhengtong Daozang were called jointly Mingzang. In Shanghai in the 1920s, photocopies of the Mingzang from White Cloud Temple were published. Taiwan also publishes a version of the Taoist Canon and so does Japan. Our canon is published jointly by Shanghai, Tianjin, and Beijing cultural relics department. Now the China Taoist Association is beginning to publish a book called Ming Daozang Revised and Punctuated Version. Some lost volumes in Mingzang were found in Dunhuang, or some volumes were robbed by British colonists from Mogao Cave in Dunhuang. After many years, we have obtained all of them. All these could be added to the Revised version. We will also punctuate those Mingzang. TRS: When could the revised version be published? Min: This year. 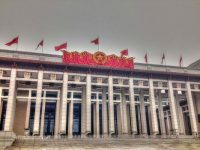 Minister of Propaganda Ministry, Mr. Wang Zhaoguo, wants the revised version to be the gift to help celebrate the 50th anniversary of the founding of the People’s Republic of China. I don’t whether we could finish it, but we’ll spare no efforts. TRS: When did you become a monk? Min: I’m 75 years old this year. TRS: Are you a native Beijinger? Min: No, I’m from Xinyang, Henan. In 1985 I officially came to Beijing. TRS: Where did you stay before that? Min: In Shaanxi. When I was eleven years old, we left Henan to Shaanxi to flee the Japanese. Then in Huashan, Shaanxi, I became a monk. TRS: Do you often go back to Huashan? Min: Almost every year I go back to Shaanxi, because I have some responsibilities in Shaanxi. TRS: What kind of Taoist book is your favorite? Min: I like all kinds of Taoism books and Taoist music. I also like Taoist history. When historians study Taoism history, they generally study it vertically. I study it horizontally. Vertical study is to study the history according to the development of history. My horizontal study is to study the effects of politics, culture, etc. posed upon Taoism. TRS: What dynasty did you study? Min: I study the whole of history. TRS: Do you have any favorite dynasty, or any dynasty which Taoism prospered? Min: In the Tang Dynasty, Taoism prospered. In the Yuan Dynasty Taoism met some setbacks, yet in the early years of the Yuan, Quanzhen was quite popular. In Ming Dynasty during Zhu Yuanzhang time Taoism suffered a reduction, yet in Wanli time, Taoism prospered again. In Song Dynasty from Gaozong Taoism enjoyed prosperity. TRS: As you mentioned before, people of achievement can become the Gods of Taoism? How long has this gone on? Min: The Chenghuang god you mentioned just now was an official in charge of Shanghai in Ming Dynasty. TRS: In Qing Dynasty we have Zheng Chenggong (aka Koxinga, a military hero). Min: Yes, in Taiwan Zheng Chenggong became Kaitai Shengzu. Gods are not superstition, they are the supreme adoration of an adored figure. TRS: What about modern times? Min: Yes, but our country doesn’t allow it. 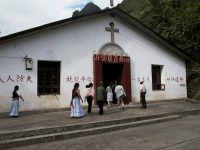 For example in some places there are Three-old-Temple(sanlaomiao), where Chairman Mao Tse-tung, General Zhu De, and Premier Zhou Enlai (three communist leaders) are respected as gods. TRS: I heard it happened in northern Shaanxi province. Min: Their achievements were respected by people, and they will be respected as gods, yet it needs time. That’s our Chinese tradition. People who have made contributions to our people and country won’t be forgotten by their descendants. Their souls in the heaven will not only protect people of their periods, but also protect their descendants. Those are our religious beliefs. TRS: Director Min, thank you for your time. We wish you good health and good luck in accomplishing your many goals for the Taoist religion. Min: Thank you for paying attention to an old monk. And thank you to TRS for its work on behalf of Chinese Taoism.